Mr. O’Rourke has been busy, in addition to the report on Icebreakers, the latest edition of the Congressional Research Service report on Coast Guard Cutter Procurement, also by Ronald O’Rourke, was also published on 23 May, 2018. You can see it here. I have reproduced the summary immediately below. Note that the price for the OPCs is already surprisingly low. 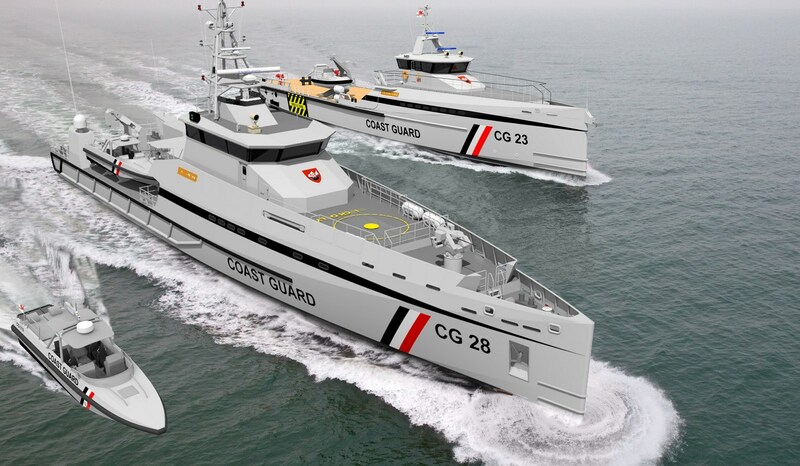 The Coast Guard’s acquisition program of record (POR) calls for procuring 8 National Security Cutters (NSCs), 25 Offshore Patrol Cutters (OPCs), and 58 Fast Response Cutters (FRCs) as replacements for 90 aging Coast Guard high-endurance cutters, medium-endurance cutters, and patrol craft. The Coast Guard’s proposed FY2019 budget requests a total of $705 million in acquisition funding for the NSC, OPC, and FRC programs. NSCs are the Coast Guard’s largest and most capable general-purpose cutters; they are intended to replace the Coast Guard’s 12 aged Hamilton-class high-endurance cutters. NSCs have an estimated average procurement cost of about $682 million per ship. Although the Coast Guard’s POR calls for procuring a total of 8 NSCs to replace the 12 Hamilton-class cutters, Congress through FY2018 has funded 11 NSCs, including two (the 10th and 11th) in FY2018. Six NSCs are now in service, and the seventh, eighth, and ninth are scheduled for delivery in 2018, 2019, and 2020, respectively. The Coast Guard’s proposed FY2019 budget requests $65 million in acquisition funding for the NSC program; this request does not include additional funding for a 12th NSC. 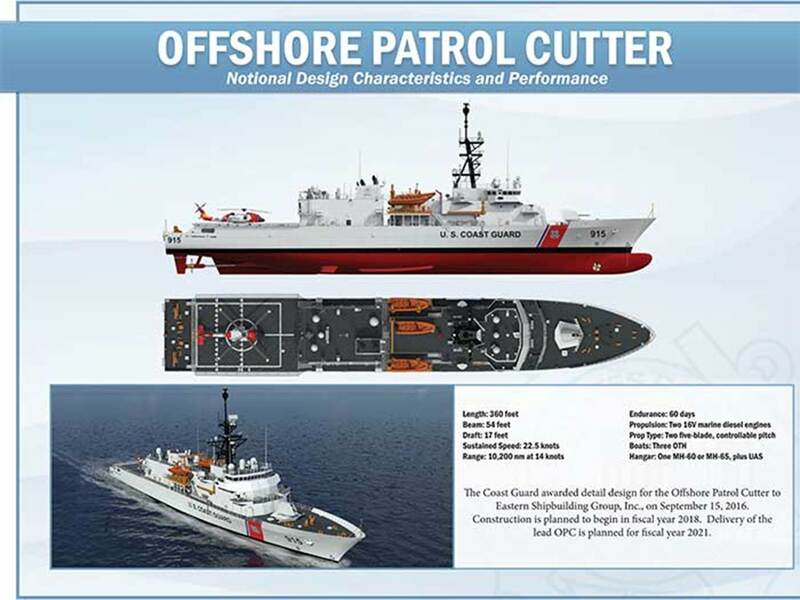 OPCs are to be smaller, less expensive, and in some respects less capable than NSCs; they are intended to replace the Coast Guard’s 29 aged medium-endurance cutters. Coast Guard officials describe the OPC program as the service’s top acquisition priority. OPCs have an estimated average procurement cost of about $391 million per ship. On September 15, 2016, the Coast Guard announced that it was awarding a contract with options for building up to nine ships in the class to Eastern Shipbuilding Group of Panama City, FL. The first OPC was funded in FY2018 and is to be delivered in 2021. The Coast Guard’s proposed FY2019 budget requests $400 million in acquisition funding for the OPC program for the construction of the second OPC (which is scheduled for delivery in 2022) and procurement of long leadtime materials (LLTM) for the third OPC (which is scheduled for delivery in 2023). FRCs are considerably smaller and less expensive than OPCs; they are intended to replace the Coast Guard’s 49 aging Island-class patrol boats. FRCs have an estimated average procurement cost of about $58 million per boat. A total of 50 have been funded through FY2018. The 27th was commissioned into service on April 20, 2018. The Coast Guard’s proposed FY2019 budget requests $240 million in acquisition funding for the procurement of four more FRCs. initial testing of the NSC. Congress’s decisions on these programs could substantially affect Coast Guard capabilities and funding requirements, and the U.S. shipbuilding industrial base. The following is written by a guest author, a friend met on Facebook, but I think you may find it interesting, particularly to non-US readers. 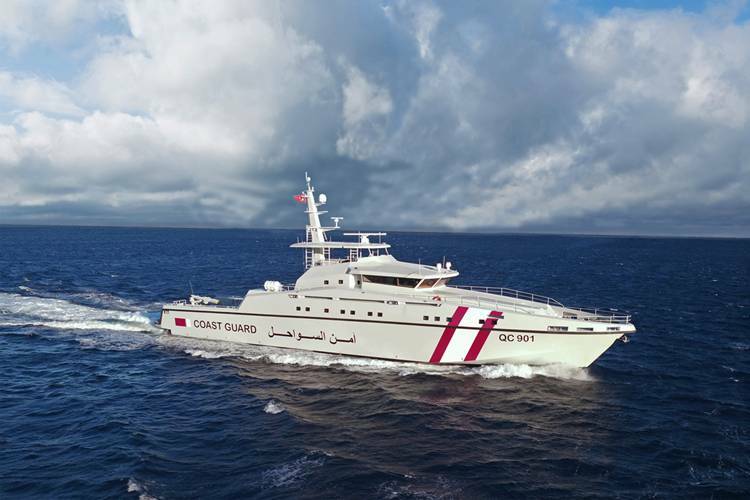 In 2013, facing an acute shortage of operational and suitable vessels, the Government of the Republic of Trinidad and Tobago (GORTT) commissioned an operational audit of the Trinidad and Tobago Coast Guard (TTCG). This did not only involve an assessment of the existing fleet, which was in abysmal condition, but also sought to ascertain force requirements to meet the existing responsibilities as well as the projected needs of the force into the foreseeable future. 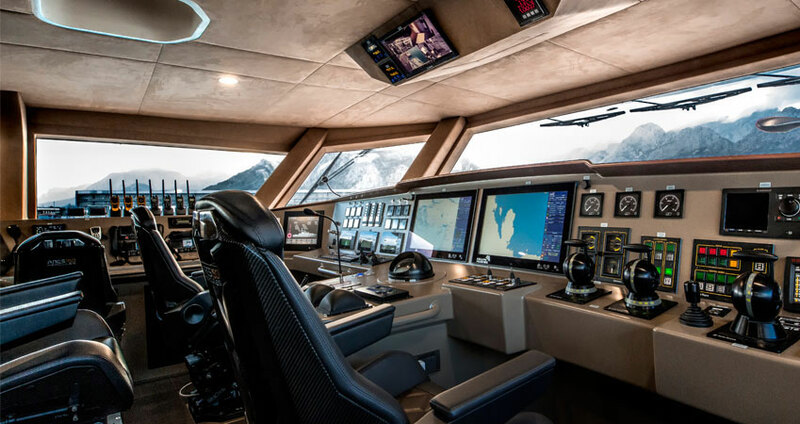 The audit team realized that despite a predilection for Offshore Patrol Vessels as priority acquisitions for both the political and military leadership, the principal weakness was in vessels designed for coastal patrol duties. 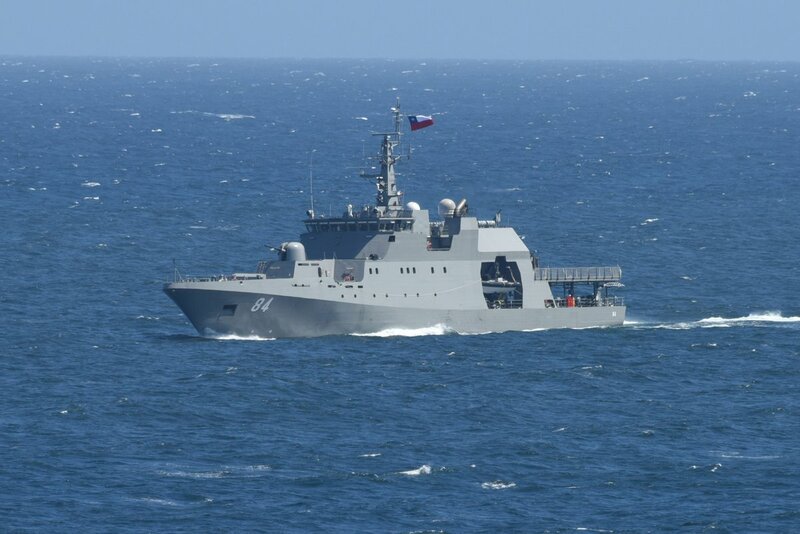 The need for Coastal Patrol Vessels (CPVs) was deemed particularly acute in part because of the unsuitability of the country’s trouble-plagued fleet of Austal FPB 30 vessels for operations in the rough seas found in some parts of the country’s maritime domain. In January 2014, the Naval Assets Acquisition Implementation Team (NAAIT) was established, bringing together former and current military officers and civilian experts with a mandate to acquire vessels for the Coast Guard within a period of under two years. Using the findings of the aforementioned audit team as a guideline, the NAAIT gave priority to the acquisition of CPVs. This, it has to be said, created a certain degree of tension with vested interests advising the GORTT who were fixated on acquiring an OPV replacement to the extent of ignoring technical advice to the contrary. The deadline for completing vessel acquisition was set at May 2015, a deadline that was to ultimately prove wholly unrealistic. While the NAAIT formally started working in January 2014, the team had the good fortune of going to sea on a Damen SPa 4207 which visited Trinidad en route to Honduras in December 2013. In addition, shortly thereafter, the team visited the Barbados Coast Guard Headquarters to inquire as to their experiences with the type. The naval architect assigned to NAAIT, based on the experiences at sea and the wave patterns in Trinidad’s maritime domain, suggested that the ideal length for a CPV would be between 45 and 55 metres with the SPa 4207 not being particularly suitable for the role in the TTCG. A matrix, using a proposed Concept of Operations (CONOPS) for the CPV in TTCG service was then created to assist the NAAIT in its decision-making process. There was a concerted push by lobbyists from Korean and Chinese shipbuilders for a team to visit their respective shipyards so, in January 2014, the NAAIT was dispatched to make a visit to Korea and China, followed by one to Colombia and finally to the Netherlands. While the evaluations of individual designs will of course remain confidential, the NAAIT was impressed with the manufacturing quality in Korea and the ambitions of Colombia. In the latter case, their efforts to market a CPV to Trinidad were hamstrung by the fact that their promising CPV-46 class was as yet under construction and thus not available for evaluation. However, Colombia’s COTECMAR, impressed NAAIT with its determination, ambition and its willingness to innovate. COTECMAR’s modification of the Fassmer 80 was marketed as a possible OPV to Trinidad and attracted much positive attention. 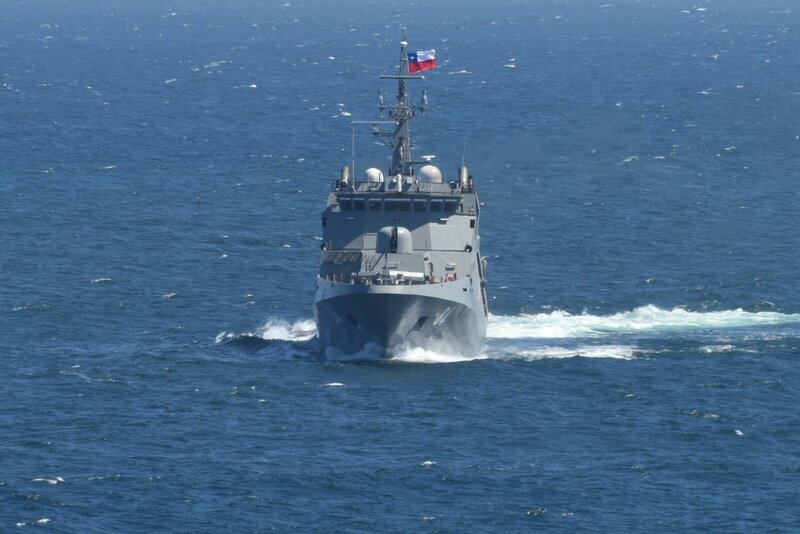 Prior to the NAAIT being formed, one such vessel visited Trinidad and while there were concerns over its top speed – only 18 knots – the lead ship of the class 20 de Julio – was seen to be of high quality and good overall capability. Korea’s Hyundai HDP-500 was of extremely high quality but was not available for delivery in the short term. 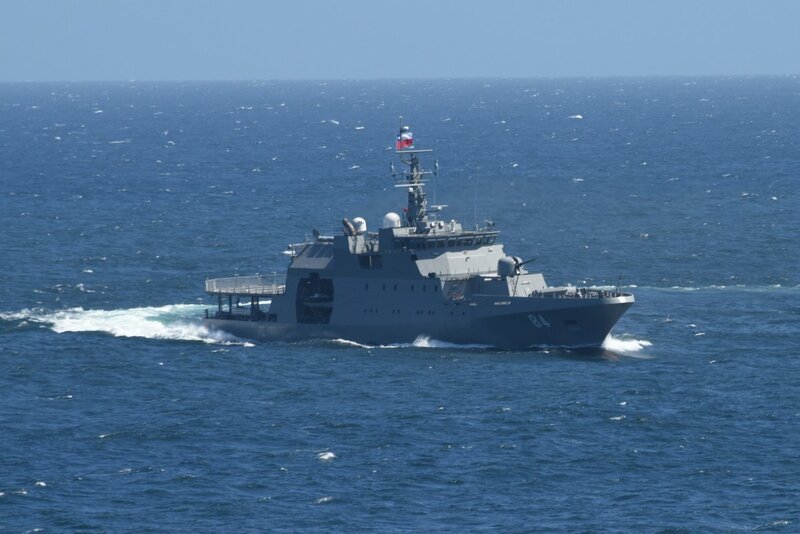 Its HDP-1000 was initially offered but soon attention shifted to the HDP-1500 which proved to be the most impressive and cost-effective OPV offered to Trinidad. However, delivery scheduling would not have met the remit of the NAAIT to acquire vessels by May 2015. China’s designs for CPVs were deemed to be of sound design and unspectacular performance but build quality was decidedly poor and the equipment suite was decidedly sub-par. 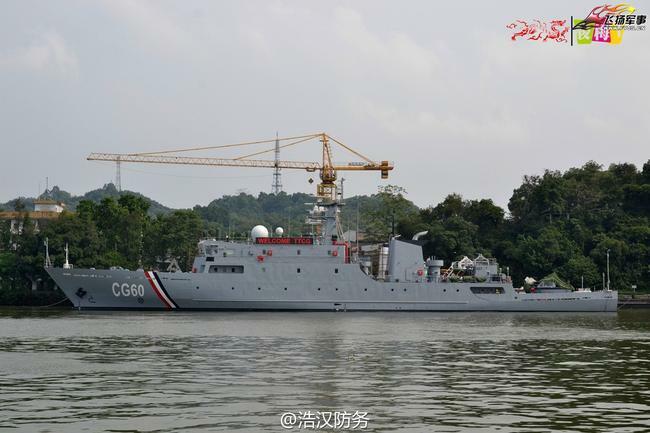 Of interest was China’s apparent belief – well-founded it later emerged – that they were guaranteed a contract for an OPV (or LRPV as the then regime in power termed the class). NAAIT was confronted, much to its surprise, with a beautiful model of an OPV in full TTCG colours with a pennant number already assigned. Damen Gorinchem shipyards was the last to be visited. At this point, NAAIT was given presentations on the SPa 5009 design and shown two hulls with immediate availability at the Schelde naval yard. In addition, two FCS 5009s were being completed at Hai Phong in Vietnam and were also available for delivery. This speed of delivery combined with the strong presence Damen had in the Caribbean – supplying vessels to Jamaica, Barbados, the Bahamas and the Dominican Republic – made the choice, given the deadline set for vessel acquisition almost inevitable. Despite the NAAIT advocating a limited tender being floated to all the concerned shipyards, the GORTT decided that the situation warranted a sole-select tender being issued to Damen Gorinchem to bid for the supply of four SPa 5009 patrol vessels, two FCS 5009 patrol/utility vessels and six DI 1102 interceptors. The total cost of the acquisition came to some USD 214 million, including a 5-year integrated logistics and support package inclusive of spares and training. The Damen SPa 5009 is an adaptation of its FCS 5009 crew-supply vessel. The latter is slightly longer and possesses a more austere equipment fit but is well suited to the task of being a utility vessel. To meet the TTCG’s requirements for a vessel capable of undertaking disaster relief operations in other parts of the Caribbean archipelago, two FCS 5009s were offered – the type having already been ordered by a petrochemical state enterprise in Trinidad. The NAAIT availed itself of the opportunity of conducting limited trials on a Cape Town built FCS 5009 “Patrol” variant in South Africa and was favourably impressed. 3) A Heila hydraulically operated knuckle-boom crane was installed which had the secondary function of being able to lower and recover a DI 1102 interceptor. These two vessels – CG 23 TTS Point Lisas and CG 24 TTS Brighton – were delivered in the period May/ June 2015 and duly commissioned into the TTCG. The SPa 5009 was then in service only with the Cabo Verde Coast Guard and the NAAIT was somewhat wary of its performance characteristics. Arrangements were made for the NAAIT to visit Cabo Verde to evaluate the Guardiao SPa 5009. Operating in the Atlantic in Sea State 5, the Guardiao handled the waves remarkably well even at its maximum speed. 3) The forward area was very wet, making the operation of a manually controlled weapon difficult and thus ruling out the original intention of using TTCG GAM-B01 Oerlikons. 5) The 7.5m RHIB, deployed using a stern launch system was deemed inadequate for TTS operations. The NAAIT, working closely with the TTCG, proceeded to examine the basic SPa 5009 design and turn it into a mini-OPV, dubbed an “OPVette” by one member of the NAAIT. This included a total revamp of the surveillance, armament and interdiction capabilities of the vessels and the replacement of the anaemic C32 engines with Caterpillar 3516C engines with D ratings. This change of powerplant became a priority as it was realized that the FCS 5009s, which used Cat 3512 engines with A ratings would have been faster than a SPa 5009s with C32s. The installation of the 3516s led to a dramatic increase in speed with an average of over 30 knots being sustained by all four vessels of the class during sea trials. The downside was that on the first two vessels, some cavitation was observed on the hulls during post-trail inspection. This was rectified as a priority. The TTCG, using its experience from the terminated BAES OPV deal (for three vessels now serving the Brazilian navy as the Amazonas class and very similar to the Batch 2 River class under delivery for the Royal Navy) insisted on the creation of a Combat Information Centre (CIC). The CIC housed displays – Transas NS4100s surveillance workstations- showing the radar, WECDIS and FLIR input with repeaters on the bridge. It was also envisaged that the CIC would house a dedicated secure communications suite supplied by Harris. Deliveries of the Harris equipment were delayed, leading to the vessels being commissioned without this equipment being fitted. The surveillance fit selected was a compromise using high quality civilian systems as opposed to dedicated military systems. The surveillance radar selected was the Kelvin Hughes X-Band Sharp Eye which emerged as the most cost-effective and available choice. The FLIR system chosen was the MU602CLW. A Saab R5 data link was also fitted along with a Rotheta RT-500M radio direction finder. It should be noted that the TTCG had expressed a desire for a Terma surveillance radar as fitted to the BAES OPVs. However, cost factors militated against this. To enhance the interdiction capabilities of the SPa 5009, the standard stern-launched MST 750SR 7.5m RHIB was supplemented by a davit launched DI 1102 interceptor. While it was intended that the interceptor be launched and recovered while the mother vessel was moving, two incidents during familiarization training may have led to a rethink in this regard. When considering choices for the weapon system, there was an attempt to look at the Israeli 25mm Typhoon system and a Reutech/Nexter combination from South Africa. Neither option proved viable. Furthermore, the TTCG desired to make use of its stock of 20mm Oerlikon ammunition. This perforce limited the choice of weapon system to one compatible with such ammunition. The final choice fell to the Rheinmetall/ MSI Seahawk LW20A1 system. This proved to be a somewhat problematic choice as two rounds of firing trials – one in 2015 and one in 2016 – were aborted due to severe malfunctions. Even during those aborted trials, however, the accuracy of the system was excellent, but the aborted trials delayed the operationalization of the vessels’ weapons systems until late 2016. Owing to somewhat delayed payments, the four SPa 5009s were delivered between 2015 and 2016 and were designated and named as follows: CG 25 – TTS Speyside, CG 26 – TTS Quinam, CG 27 – TTS Moruga and CG 28 – TTS Carli Bay. Each of these vessels carried a DI 1102 interceptor, with two more being deployable on CG 23 and CG 24. The Damen acquisition program was the only completely successful acquisition projects undertaken during the government of Mrs. Kamla Persad-Bissessar which lasted from 2010-2015. During this time, the program faced many hurdles – some political and others fiscal – that delayed contract signing and subsequent payments. The NAAIT would have preferred that the CPV and OPV projects be handled through a more open, albeit perhaps limited, tender process but the dual pressures of a political timeline and the urgency of the TTCG’s requirements, the sole-select tender process was approved by GORTT. Nonetheless, despite that wish, the thoroughness of the initial work by the NAAIT made the team confident that the CPV choice, at any rate, was a good one. Unfortunately, the NAAIT, despite its mandate, was effectively removed from the OPV acquisition process. No tender of any kind was issued and a controversial decision to acquire a 79m vessel from China’s CSSC was undertaken. This latter vessel, now designated and named CG 60 TTS Nelson II, was delivered in late 2015. Whether the limited capability it offered was worth the price is at best debatable. As I said the Greeks and Turks have been going at each other for a while. The intentional collision below reportedly happened on January 17, 2018. The video below was posted to YouTube May 8, 2016. Thanks to Luke for bringing this to my attention. Photographs taken during day 3 of the Royal Australian Navy International Fleet Review 2013. The Bruneian patrol vessel Darulaman moored in Sydney Harbour. Photo by Saberwyn. The Australian Navy has announced the selection of the design for a planned program of 12 Offshore Patrol Vessels to replace the 13 active 300 ton Armidale class patrol boats. The new ships will be built in Australia. 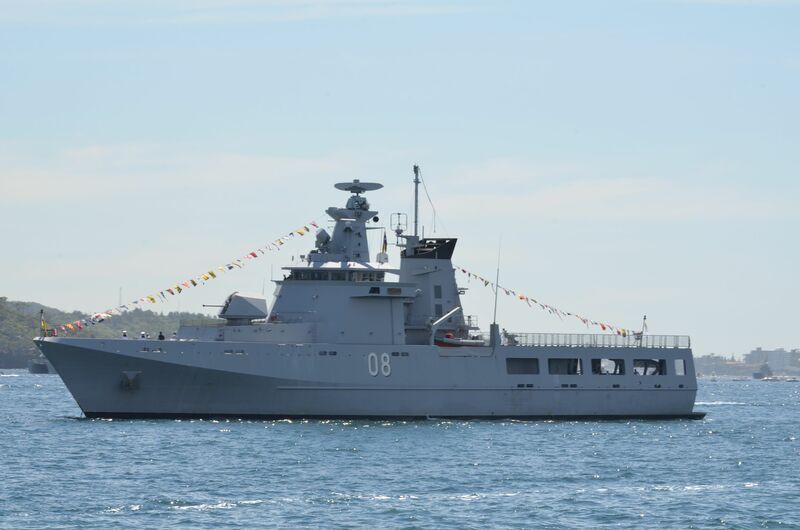 The design is based on that of the Durussalam class, four ships built for the Brunei Navy by Lurssen in Germany. Lurssen is famous for their torpedo and missile boats. The vessels are expected to be 80 meters (262 ft) long and 13 meters (43 ft) of beam with a draft of four meters (13 ft) with a speed of 22 knots. Unlike most of the Brunei ships, the Australian ships will be armed with a 40mm gun rather than the 57mm seen in the illustration above. The Australian OPVs are expected to have provision for three 8.4 meter boats and mission modules. I am a bit surprised by the choice because this appears to be the least capable of the contenders in that it has no hangar, but it does double the range of the patrol boats they will replace and is more than five times the displacements, so should prove a substantial improvement over the Armidale class that really seem to have been asked to do more than could reasonably expected of them. 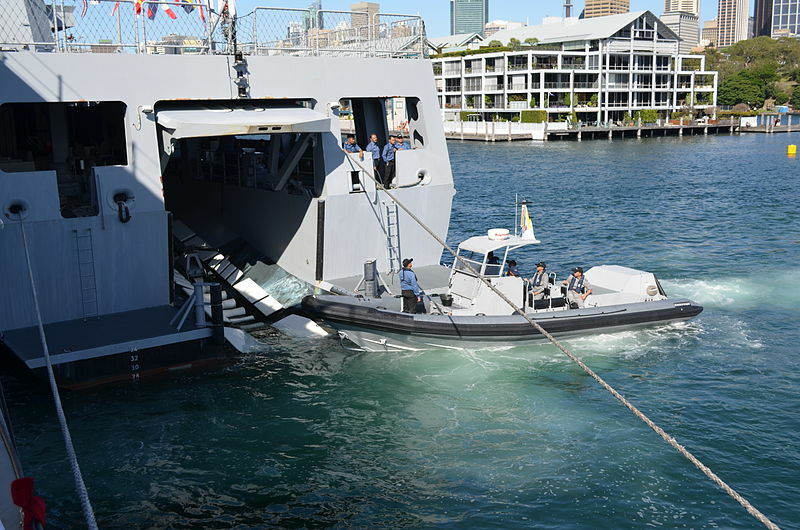 In some ways these are the embodiment of the Cutter X concept in that they seem to have the equipment and crew of a patrol craft in a more sea worthy hull, but they have also taken the opportunity to provide more boats and a helicopter deck. Photograph taken during day 5 of the Royal Australian Navy International Fleet Review 2013. Stern view of the Bruneian patrol vessel Darulaman, The ship’s RHIB is deployed, and the RHIB well is open. Photo by Saberwyn. Thanks to Nicky for bringing this to my attention.